A 16 hour short course that prepares for new workers for entry level jobs in racing, such as hot walker or new groom. Is not a certification course. A complete list of topics is available from the left hand menu. 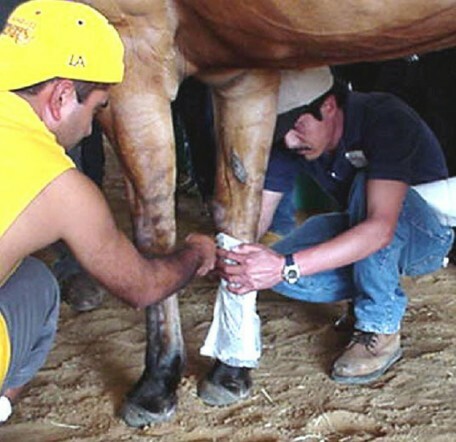 The "flagship course" that is an extensive 40 hour course conducted over several weeks that is the only nationally recognized groom certification program for grooms with some job experience and focuses important horse care skills that are essential in effective racing grooms. A complete list of topics is available from the left hand menu. Advanced Certification course for GE101 grads with a focus on lower leg injuries and effective care of leg & muscle injuries. A complete list of topics is available from the left hand menu.